Night of the Ace: Who will step up as Northwestern’s Friday night starter? That pitcher who runs out onto the mound on Friday nights is the pacesetter for the rest of the weekend in college baseball. The first game of a weekend set is crucial to how teams tends to perform, so programs put their best guy on the mound to give them the best shot at winning Game One. The Friday night Ace – the No. 1 starter in the rotation — isn’t afraid of the lights, the big stage, or the moment. The starter refuses to be intimidated by opposing lineups and boasts a confidence and mental fortitude that will get him out of jams. He is the leader and anchor of the starting rotation Northwestern pitching coach Josh Reynolds said. “Your team feels that when he touches the mound, we have a chance to win this game,” said Reynolds and Northwestern has to figure out who that guy is for them in 2019. Expect Northwestern’s decision to come sooner rather than later. The Wildcats will take on Brigham Young University at 7 p.m. Friday in Mesa, Arizona, and someone must take the mound. 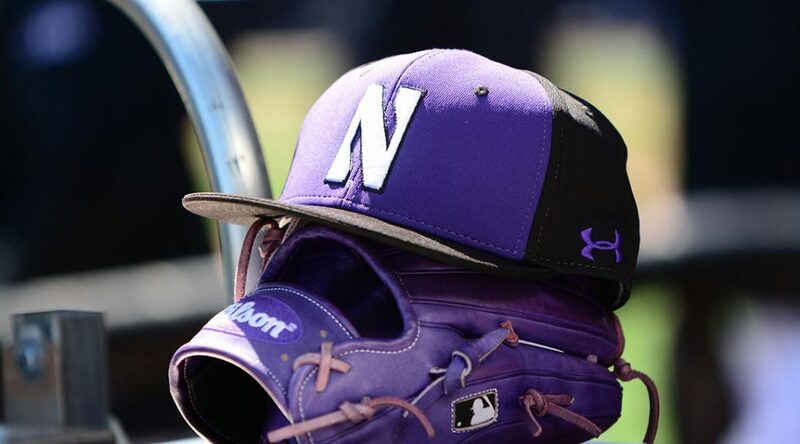 As the first pitch of the year moves closer, the Northwestern University coaching staff has its options trimmed to three: Hank Christie, Jack Pagliarini and Quinn Lavelle, all returners with a solid amount of innings under their belt. Despite the bevy of arms, they have confidence in throughout their pitching staff, Christie, Pagliarini and Lavelle will be the locks in their starting rotation. Still, the Wildcats must decide whom they are going to hand the ball on Friday nights. 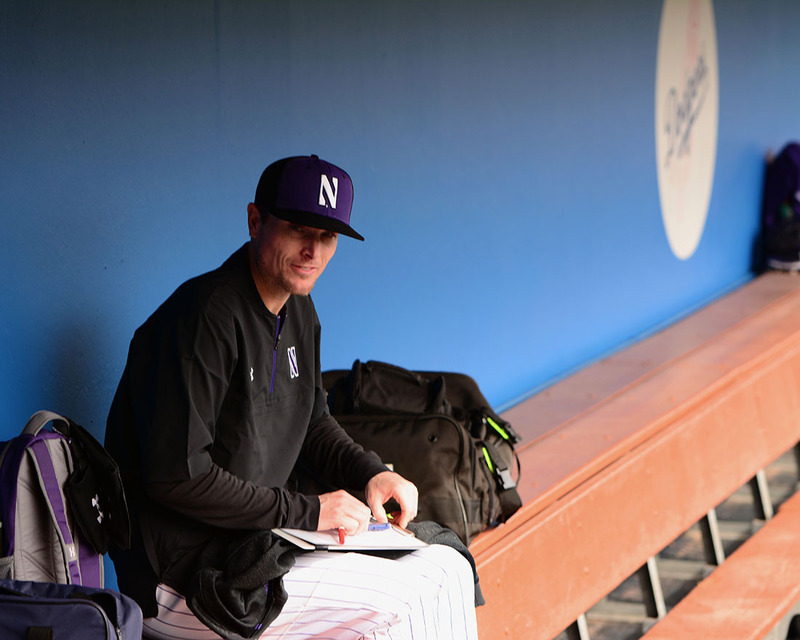 Northwestern pitching coach Josh Reynolds prepares for game time in the dugout vs. Nebraska on February 17. (Carolyn Katz/Carolyn Katz Photography). The differences in what each pitcher does well is a part of the dilemma. Here’s a tale of the tape for the three, based on team staff and clubhouse reviews. Christie: The oldest of the trio, Christie, a junior, has the most experience of the three. The righty sports the classic three-pitch mix (fastball, changeup, curve), however it’s his confidence that can really elevate his game to the next level when he’s on. Northwestern left-handed pitcher Quinn Lavelle throws warmup pitches between innings vs. the University of Texas on March 2. (Carolyn Katz/Carolyn Katz Photography). Lavelle: The lefty sophomore may have the best feel on the mound, Reynolds said. Lavelle is described by his teammates as a crafty lefty that always finds himself in the right position on the mound and has a level of composure that makes him tough to fluster. Northwestern left-handed pitcher Jack Pagliarini winds up to throw in a game against Central Michigan University last March. (Carolyn Katz/Carolyn Katz Photography). Pagliarini: Out of the three, Pagliarini may have the best “stuff” on the team according to head coach Spencer Allen. Pagliarini’s repertoire features a breaking ball that gives opposing batters a tough time, and consequently drives up Pagliarini’s strikeout rate compared to Christie and Lavelle that pitch more to contact to generate outs. The skillset each pitcher boasts has some of the qualities a coach looks for when tabbing the ace of a college pitching staff. Between the three of them, there’s grit, confidence, composure, and intensity. The decision for the Northwestern coaching staff will by no means be easy. Additionally, it’s not the coaching staff alone that’s aware of each pitchers’ ability, the importance of the Friday night starter, and what each pitcher needs to do to assume the role of staff ace. Rather, the eyes of all three have been on one another. “I don’t know if they do, but I am certainly checking up on a couple of their numbers when they throw to see how they are doing,” said Christie with a sly grin, mentioning that he felt a sense of competition growing in the summer as the strides Lavelle and Pagliarini made in the weight room and beyond catalyzed his desire to work harder. 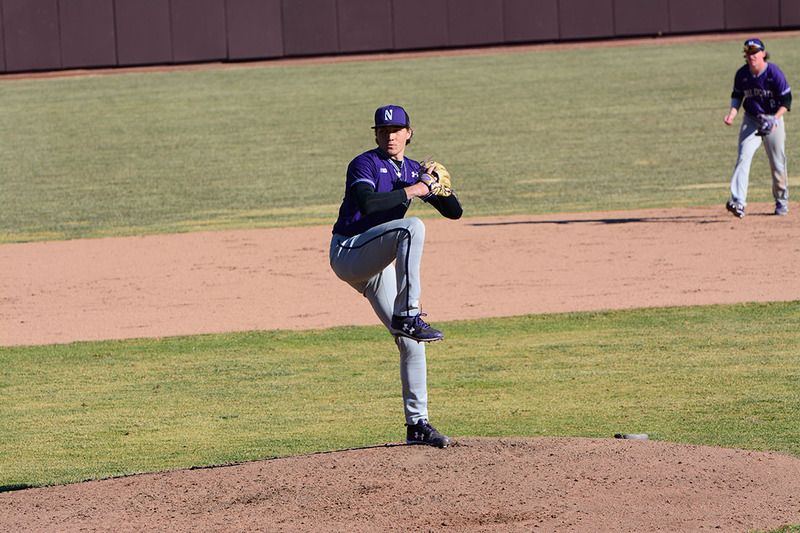 Northwestern righty Hank Christie throws a pitch on opening day last February against the Nebraska Cornhuskers (Carolyn Katz/Carolyn Katz Photography). But Christie wanted to make it clear that whatever competition existed between the trio was friendly, and if anything, was helpful to the development of all three. The atmosphere is wringing the competitive juices out of the entire Northwestern pitching staff, as pitchers must bring their best stuff every day. They have no space to be off their game, and this approach will hopefully bring the best out of every pitcher. How each pitcher handles the “running game,” and manages the runners on base and the pressure that runners can apply to the Wildcats defense. Can the person handle the Friday night atmosphere? Or does one of the three have a better feel for pitching the Saturday or Sunday game to follow, which carries less pressure? Who gives NU the best chance at winning on Friday night? The numbers each pitcher produces throughout the year will come into play as the season moves forward. Regardless of who that might be, the Northwestern coaching staff is confident that either one of trio can go out and set the tone, not only for the first weekend of the season, but for the year.